Graphene agents also exhibit lower toxicity compared to gadolinium, which has had restrictions placed on its usage by the FDA. Additionally, most standard MRI contrast agents are not suitable for extended-residence-intravascular (blood pool), or tissue (organ)-specific imaging, and do not allow molecular imaging. The race to develop this next generation of agents is being carried out in academic and industry labs around the world. 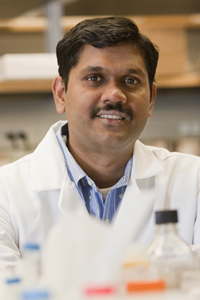 Dr. Sitharaman and his team are making excellent progress, having secured funding (in the form of a Wallace H. Coulter Foundation Translational Research Award) for clinical trials and started a company, Theragnostic Technologies, Inc., to commercialize the venture. Stony Brook University’s reach extends from its 1,039-acre campus on Long Island’s North Shore – encompassing the main academic areas, Stony Brook University Medical Center, the Health Sciences Center (Schools of Medicine), and the Veterans Home – to Stony Brook Manhattan, a new Research and Development Park, three business incubators, and the Stony Brook Southampton campus on Long Island’s East End. Stony Brook also co-manages Brookhaven National Laboratory, joining Princeton, the University of Chicago, Stanford, and the University of California as the only major institutions involved in a research collaboration with a national lab. Biotechnology Calendar Inc. invites Long Island area biomedical and life science researchers to attend its 7th Annual BioResearch Product Faire™ event on the Stony Brook University to view life science products on campus on October 18, 2012. The event is an excellent place for researchers and suppliers of medical equipment and laboratory tools to meet and discuss the latest advances in technology. See our full 2012 Nationwide Show Schedule for all other locations.